Lately I’ve been reading a lot of Jungle-themed comics from the Golden Age. While there are a ton of really cool genre elements like monsters, lost cities, evil wizards, and the like, the stories are very definitely of a different era. Virtually every story contains brutally racist depictions of natives that are not only pretty queasy by today’s standards, but should have been considered shameful even when they were originally published. The fellow pictured above, Kaanga, is one of the worst offenders. 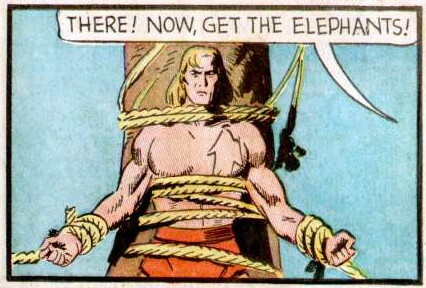 The main feature in Jungle Comics, this guy himself is just a standard Tarzan clone. But his enemies are almost all natives (or the very welcome [white, of course] mad scientist), and his arch enemy is a homeless Black American criminal who moves to Africa to run a tribe there. He wears a tophat and seems like his comes from a minstrel show. A Very Gainsbourg Christmas: Year 6! A Very Gainsbourg Christmas: YEAR 5! New EN World Post: I Have Too Much RPG Stuff! I'll Be at NORWESCON in Seattle This Weekend!